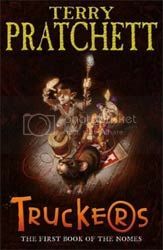 April's OBC book is book one in The Bromeliad by Terry Pratchett; Truckers. To the thousands of the tiny nomes who live under the floorboards of a large department store, there is no Outside. Things like Day and Night, Sun and Rain are just daft old legends. Then a devastating piece of news shatters their existence: the Store - their whole world - is to be demolished. And it's up to Masklin, one of the last nomes to come into the Store, to mastermind an unbelievable escape plan that will take all the nomes into the dangers of the great Outside ... The first title in the magnificent trilogy, The Bromeliad.